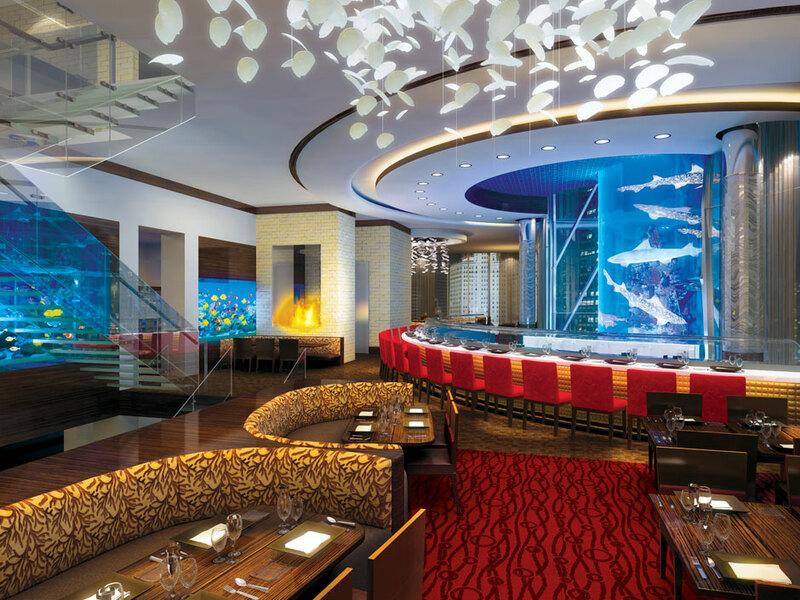 Enter the Seascape Dining Room through a surround of aquatic splendor. Flanked first by walls of jellyfish floating on silken veils, guests cross a transparent bridge arched above a floor of stingrays in mimed flight. Fascination! More than just a collection of fish tanks, Barrier Reef will be an esquisitely themed aquatic wonderland. Two Entry Jellyfish Aquariums; Each 8' x 8' with 5' x 5' Viewing windows; Total 2,000 gal. Stingray Floor Aquarium 11' x 16' x 2' with Acrylic/Glass Bridge; 2,700 gal. Host Area Koi Pond with View of Hotel Drop-off Area Through Bottom of Pond; 13' x 6' x 3''; 1,900 gal. Three Double-sided Aquariums Viewed from Hallway and Private Dining Rooms; Each 10' x 30" x 42"; Total 2,000 gal. Private Dining Room; Radius-end Aquarium 4' x 4' x 42"; Total 2,000 gal. Dining Room 2; Double-sided Aquarium 25' x 30" x 42"; 1,700 gal. Dining Room 3; Double-sided Aquarium 15' x 30" x 42"; 980 gal. Behind every outstanding restaurant lies the passion, dedication, and creativity of dozens of talented individuals. The Seascape Dining Room is no exception. The team has created true destination dining without the bother of travel. On this pleasant journey you'll discover seafood delicacies with lush wine complements served amid a tropical, aquatic panoply unmatched by any dining experience anywhere. This bold, unique concept in dining will transcend, "I'll have the usual." Here guests make it their own private party. 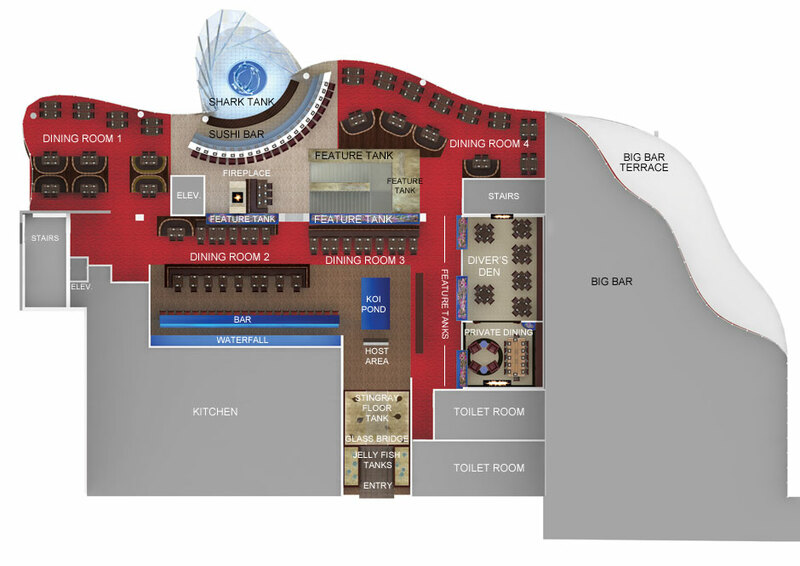 Diver's Den will provide the same excellent menu and service of Seascape Dining with more privacy. 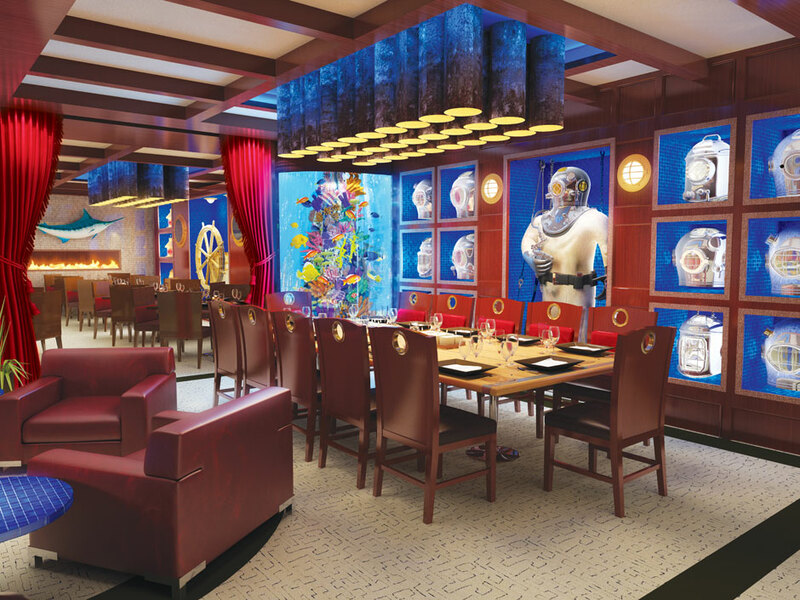 Upon entering, guests will be entertained by the vibrantly-colored fish in see-through aquariums shared with the dining room. In this relaxed and private retreat, guests will enjoy their own aquarium of spectacular tropical fish and a wall of diving artifacts and antique treasures from the deep.